The Nature of Crafty Things: RetroSketch and a TAWS giveaway!! Awesome card! Thank you for the chance to win. This is fantastic! Love the image, the layout and the colors!!! Always love your cards this one is so sweet!!!!! Such an adorable image with a sweet card design, love it. Thanks for a chance to win!!! Adorable card--I like the cloud background and the pink clouds. the two sets complement each other so well. I love the expression on the frogs face. Your card is very pretty. Love the cloud paper and the added clouds. Cutting out the center really makes the "unicorn" stand out. thanks for sharing. How you came up with the idea to add those little pink clouds I'll never know. Perfect! Those pink clouds and the unicorn with the tie-on wings and horn are just so adorable!!! Adorable card - love this! Thanks for the chance to win! Sweet card, love the coloring especially . This is so sweet! The unicorn is darling! Kasia, I love this sketch and I love your retake! It's adorable. My unicorn-loving niece would go crazy over it. The heart clouds are too cute. What a cute card...I love the pink clouds and the negative die cut space where you placed the main image. Great design. I *may* have let out a little squeal when I saw your card! 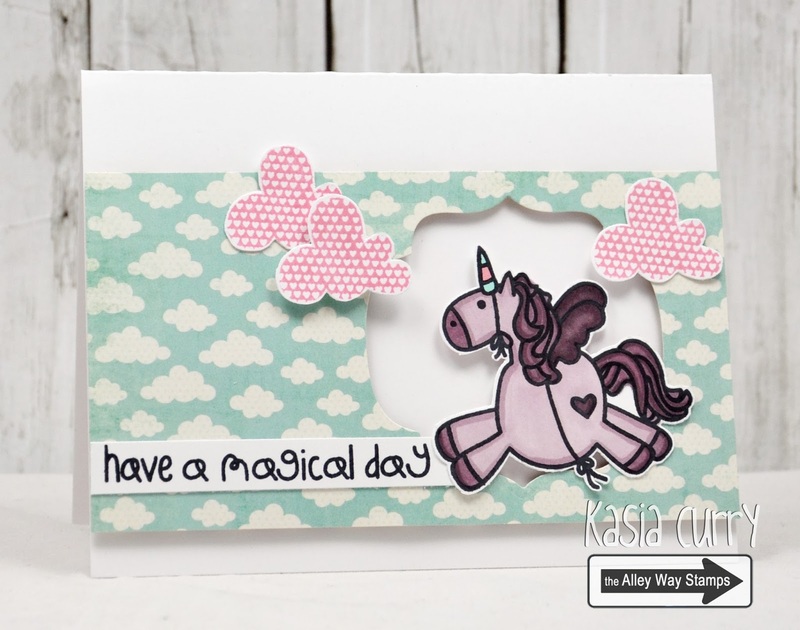 Darling unicorn and the pink clouds = way, way tooooo cute! Fabulous! Such a cute card. Love the sweet unicorn. Adorable card! Thanks for a great sketch! Such a super sweet card! Where is the cloud paper from I totally love it!